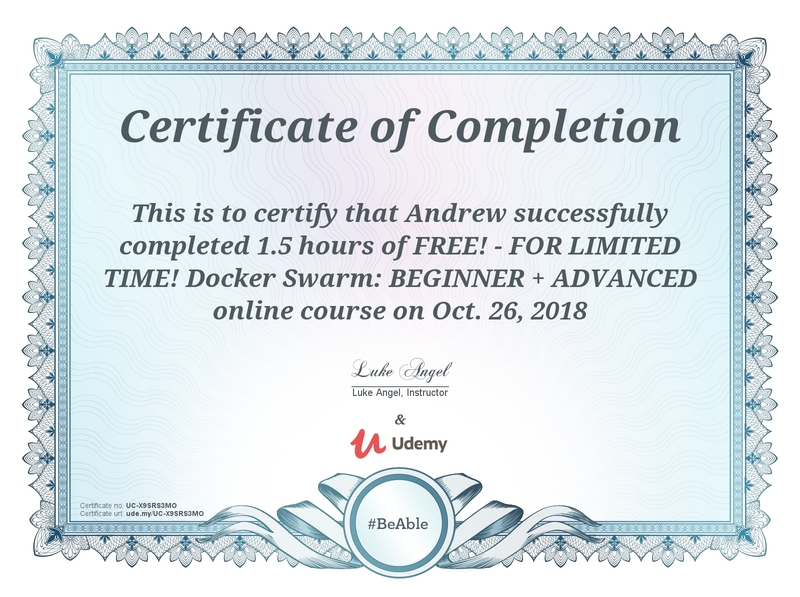 I recently found short two courses about Docker on Udemy there were listed as free by the author as they get ready to update the course. This is a review of Docker Swarm: Beginner + Advanced by Luke Angel. This is the second course I've reviewed by this author. The previous course was reviewed here. This is another hour long course and promises "foundational knowledge" by the end of the course. I disagree with this. The course starts with a lecture that is essentially an ad (almost in the form of a TV episode trailer) for the course. There are duplicate lectures, which seems to be a recurring problem based on the same issue in the previous course. Another problem that has carried over from the previous course is audio issues and inconsistencies. This is not a beginner course, despite the name. The author assumes knowledge of Docker and does not explain concepts when the "demo" starts. Speaking of the "demo", this isn't a true demonstration of the product. Instead, the author provides a ZIP file of commands that are run and outputs of those commands. In the lectures, a few elements of the output are highlighted and explained. I didn't find this to be a useful demonstration. This is a course that is several years old. It is not well put together, with multiple lectures being duplicated. Sound issues plague the presentation throughout the hour. These are all similar complaints to the previous course. This course also includes a demonstration, that is really just looking at the output of an attached text file. For a demonstration, I was expecting to be able to follow along, as as this is "Beginner + Advanced", I was expecting some kind of instructions on how to set up my environment. There is none. I don't recommend this course (or the previous one) because of how little "useful" content is fit into these two hours.